This Ilyushin Il-28 'Beagle' was the first jet bomber to enter service with the USSR as well as the Eastern Block countries of the Warsaw Pact. The Il-28 was powered by Rolls-Royce turbojets supplied by Britian just before the Cold War began. With manual bomb-aiming and even a manned tail turret, the Il-28 was very much a jet-powered World War II bomber, but over 1000 were built and eventually exported to soviet allies in the Arab world like Syria and Yemen. Nigeria used Il-28s in the Biafran War. China manufactured its own Il-28s as the B-5 bomber and continued using the type long after the Soviet and Warsaw Pact aircraft had been retired. 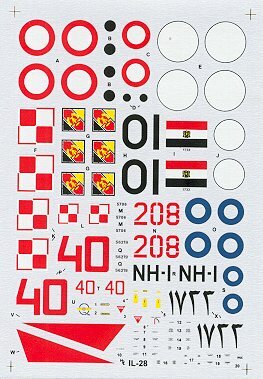 This sheet offers the modeller 4 decal options. 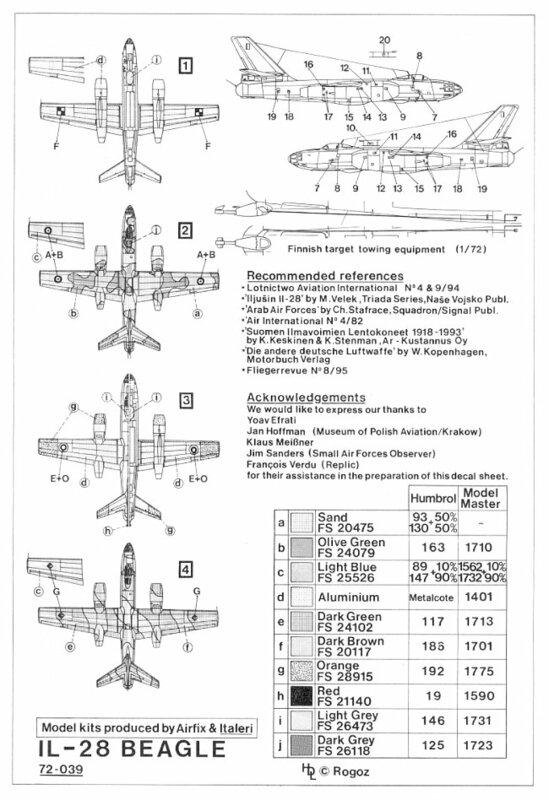 There are enough stencils included to do one of the 4 planes featured on this sheet, although with additional stencils all four planes could be made. The first decal option is for an IL-28 Beagle with the 7th Bomber Brigade of the Polish Airforce from Powidz AB in 1963. This plane is painted light Grey (FS 26473) and bare metal, with a bit of red (FS 21140) at the top of the vertical stabilizer. 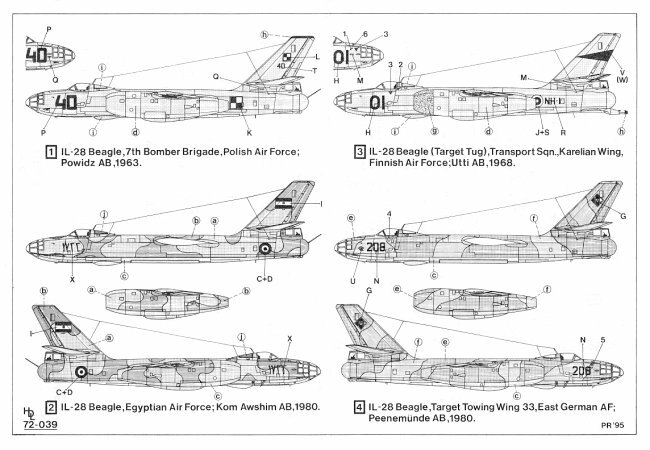 The second decal options is for an IL-28 Beagle of the Egyptian Air Force from Kom Awshim AB in 1980. This plane is painted Sand (FS 20475) and Olive Green (FS 24079) on topside and Light Blue (FS 25526) on the bottomside.  The third decal option is for an IL-28 Beagle (Target Tug) fron the transport squadron of the Karelian Wing of the Finnish Air Force out of Utti AB in 1968. This plane is painted Baremetal with Orange (FS 28915) engine nacelles. The fourth decal option is for anIL-28 Beagle of the Target Towing Wing 33 of the East German Air Force AF out of Peenemunde AB in 1980. This plane is painted Dark Green (FS 24102) Dark Brown (FS 20117) on the topside and Light Blue (FS 25526) on the underside.